I pulled the drawstring on my hoodie half way out. One end of the string is there and the other end of the drawstring is stuck somewhere in the middle. How do I feed the drawstring back out of the hole? Can I do it without removing the complete string? If I pull it out all the way, I do not think I can ever get it back in again. I tried the paper clip and safety pin trick but it did not work. Is there an easy way to do this fast? Put a small hook on the end of a metal coat hanger with pliers. Slide it into the hoodie drawstring channel. Slide it until it is about an inch past the end of the drawstring. Rotate the coat hanger a full circle to try and “grab” the drawstring. Carefully slide the coat hanger out and the end of the drawstring should be attached. Bunch up the hoodie drawstring channel. Bunch it up until you are as close to the end of the drawstring as possible. Slide the end of your needle nose pliers into the channel. Grab the end of the drawstring with the pliers and pull out. Put it in the hole that the drawstring is stuck in and follow up to the end of the string. Be sure to bunch up the fabric as you go. You will have to spear the end of the drawstring and then carefully pull it out. Slide a safety pin through the end of the channel where the drawstring in stuck. Feel through the material and grip the pin flat. Hold the pin on the string end. Slide the string channel material over the pin and grab the outboard end of the pin. Draw the hoodie material backwards over the string. Keep doing this until you have the string out the other end. Put a small hook on the end of a paper clip using needle nose pliers. Slide it into the hoodie drawstring channel while “bunching up the material”. Slide the paper clip until it is about an inch past the end of the drawstring. Rotate the paper clip a few times to try and “grab” the drawstring. Carefully slide the paper clip out and the end of the drawstring should be attached. Slide the straw into the channel. 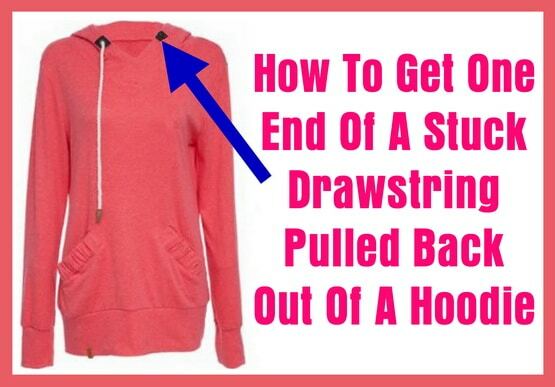 Work the straw into the hoodie channel until you reach the end of the drawstring. Slide the straw onto the end of the drawstring. With the string stuck in the straw, slide the straw out and the drawstring should come with it. NOTE: These methods work for ANYTHING that has a drawstring including men’s swim shorts and sweatpants. These methods will also work for getting a completely removed drawstring back into a hoodie, sweatpants, or swim shorts. How to restring your Hoodie or Sweatshirt in less than a Minute! Next post: Dishwasher Is Leaking Water From The Door – How To Fix?